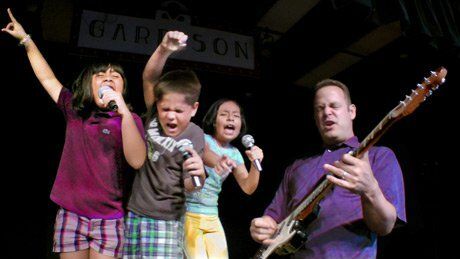 Teacher Jon Schwartz and his first-graders rockin it out on stage. When I started playing blues songs for my first grade students, I never imagined I was introducing a fantastic launching point for thematic, standards-based teaching. We soon formed The Kids Like Blues Band, and since last March we've used blues songs as a springboard for teaching academic content standards in reading, writing, listening, speech, social studies, technology, and the visual and performing arts. So far we've played at a street fair, for staff and students at the Cal State San Marcos College of Education, and even live on local TV news and KPBS TV. We're a real band, and the students are fully engaged, learning and rocking! How does this method work? First, I introduce a song and apply the rhythm and cadence of these lyrics to an understanding of the historical background. Songs are carefully selected to have appropriate levels of syllabication, vocabulary, imagery and subject matter that lead into history, myths or folktales. Students learn phonics through pointing and tracking to lyrics on score sheets kept in individual student binders. Lyrics are practiced daily in large and small groups to get the correct pitch, modulation, tone, syllabication, meter and phrasing. Children even sneak practices during free time. After learning the lyrics, students with creative dance skills choreograph the piece (without my help!) and we rehearse more. Then, it is a "gig" at a talent show, street fair or community event. Last spring, Professor of Education Dr. Leslie Mauerman thought so much of our work that she had us play for an audience of staff and graduate students at Cal State San Marcos College of Education. Our blues band work meets the needs of a wide variety of students with different learning styles and preferences, including kinesthetic, auditory and visual learners. Oftentimes, a student is paired with another learner to work on skill deficiencies. Collaboration nurtures natural talent and leadership. Shy students gain confidence, high performing and GATE (Gifted And Talented Education) students achieve new levels of mastery, non-native English speakers improve language, and slower readers learn reading at a higher level of complexity. Our blues band has provided my students with a creative outlet to apply, question, evaluate and utilize their knowledge. For many English-Language Learners, thematic teaching allows them to maximize learning in a comfortable, fun, student-centered environment. A noteworthy student testimonial is a Japanese student who recently moved to the United States. On top of leaving her home and everything familiar to her following the nuclear disaster at Fukushima and the tsunami, she was now starting a new school mid-year and unable to make sense of anything we were doing. Soon after her arrival I started playing blues songs for the class. A GATE student began dancing and acting out the song we were singing. Other students began to jump in and participate – including our new Japanese student! Instantly, she became animated, engaged and wanted to be an active participant in our class. Over the course of the following weeks, she began to take more risks, quickly memorized the lyrics and began learning how to form English sounds. While she remained reserved and timid in small groups, when the music began she came to life, able to participate and communicate with her peers. This instruction has fostered a heightened ability to access and apply technology. My first and second grade students blog about their music and learning, while using Photoshop, scanners and Google image searches to design multilayered compositions to accompany their blogs. Here's a video that showcases how we use technology like Photoshop and blogging to engage students in reading, writing and arts. The students and I have also delved into digital video editing and audio production. We record our work and edit it as a whole class on the LCD projector in iMovie and Garage Band. Watch our "official" music video below. Nearly a year later, I have looped with my class, and I am in awe as all students have made significant progress across subject areas and learned to work together as a classroom community. The Kids Like Blues project has not only taken my students' learning to new and unprecedented levels, it has also inspired me to be a better teacher and given me the confidence to bring my own passions to the classroom. In today's world of high-stake testing and concern for students' lack of skills for college and careers, I feel my class of "blues-singing" students is more than prepared. For more information about this project, please visit http://kidslikeblues.org/.